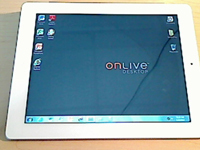 Onlive desktop provides a Windows desktop environment on the iPad. Amazingly, the free version of the app comes with MS Office 2010 including Word, Excel, and PowerPoint. The free version also comes with 2 GB of cloud storage. There is also a paid version for $4.99/month that gives priority access to the OnLive Desktop service. 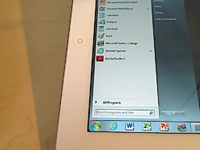 When OnLive is opened on the iPad, you see the familiar Windows 7 desktop. Programs preloaded on the free version include Adobe Reader X, Internet Explorer 9, MS Collage, MS Paint, and the familiar MS Calculator, WordPad. Notepad, and Recycle Bin, in addition to the MS Office apps. All applications work as they would on a Windows-based PC. You’ll also notice an additional desktop icon for the OnLive file folder. Clicking this takes you to a Windows Explorer window containing any created files or files previously uploaded to their cloud service. All files are automatically synced with OnLive’s cloud-based service. Keyboard input is through a keyboard toggle button on the bottom of the screen. One tap opens the keyboard and another tap closes. This differs from other iPad apps where a tap on the editing screen will bring up the keyboard. 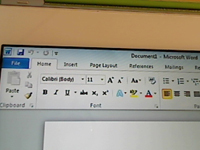 I was thrilled to have the familiar MS Office applications on the iPad, and especially without the cost. The biggest plus was the ability to create and present PP presentations on the iPad using the full functionality of the latest PP version. The only downside to OnLive Desktop is the convoluted file sharing system. I've been totally spoiled by the elegantly simple method used by DropBox for syncing and sharing files. OnLive seems to lock you into its file environment. I couldn’t find a way of dragging files to my iPad DropBox folder. Sharing files requires logging in to the cloud version of OnLive and downloading from there. Although OnLive is not a file sharing service, the inclusion of the familiar DropBox icon on the desktop would be my number one priority. Overall, OnLive Desktop is an amazing bargain. You get the major applications from MS Office 2010, the ability to run Flash-based apps on an iPad, and a smooth interface, all for free. If you can get by the clunky, proprietary file management structure, this is an app worth having on your iPad desktop.